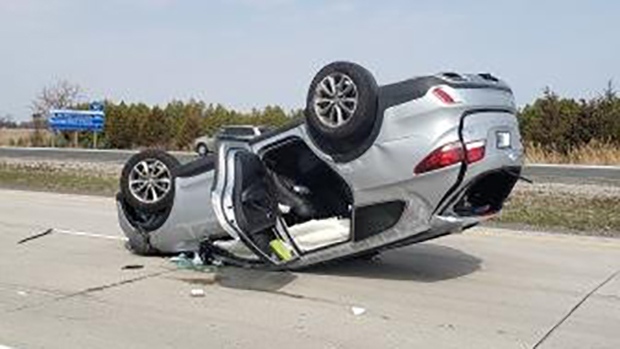 Chatham-Kent OPP provided this image of a rollover on Highway 401 near Communications Road in Chatham, Ont. on Wednesday, April 17, 2019. Anyone travelling eastbound on Highway 401 in Chatham-Kent Wednesday morning might have been impacted by a crash. The eastbound lanes of the 401 at Communications Road were blocked due to a single-vehicle rollover collision around 10 a.m.
Chatham-Kent OPP say the road reopened around noon. The driver and passenger have since been treated in hospital for minor injuries. The driver, a 69-year-old Guelph man, has been charged with careless driving.